I’m using the hops that I didn’t send to the local brewery to practice the drying process. 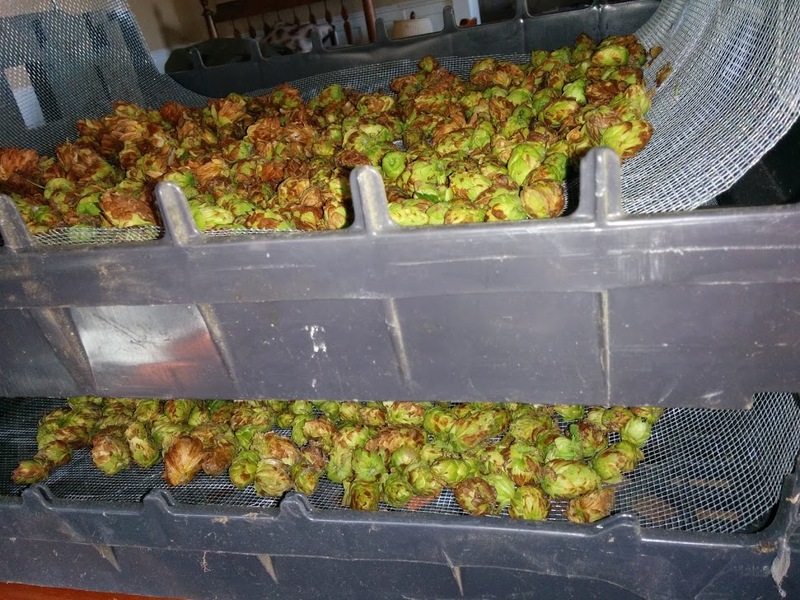 Once picked, hops need to be dried so they don’t mold while also kept from exposure to light. The latter needs to be observed all the way until the finished beer is consumed. Light exposure activates the photosynthetic tissue in residual hop matter that flavors or bitters beer resulting in the distinct “skunk” flavor that has actually become a characteristic flavor of some European beers packaged in green bottles then shipped to the US. So I use discarded beverage trays lined with discarded screen in combination with time to dry my hops. Mild heat or airflow can be used to speed the process but I avoid mechanical processing and strong airflows that might dislodge the pollen looking resins that contain the desired acids/flavor/aroma compounds. This is only mentioned because some people use tumble driers or even clothing driers! When the test sample of hops loses 80% of it weight, I store them in ziplock bags, squeeze the air out then freeze. If I’m feeling less lazy, I’ll vacuum pack the hops in a food saver. When I am feeling conditionally lazy like with this batch, I’ll spend 5 hours brewing a batch of beer just to avoid the 20 seconds it takes to toss the hops into a freezer. Note: this is just my casual process for harvesting poor quality first year hops. Usually hops are mostly green, but my centennial hops were overripe thus overdried on the vine while the cascade hops were underripe with the first frost bearing down that weekend. So I harvested and processed them together!